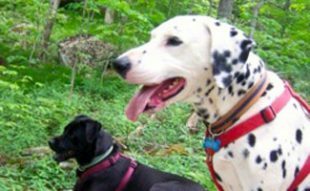 Dog Tales is an ongoing column on featured guest writers and readers who are sharing the stories of their beloved canine chronicles. 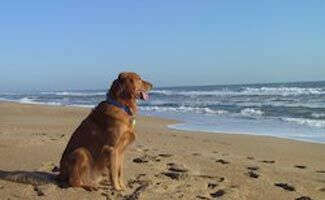 Nancy Bishop, a reader and the author of this article, lives in North Carolina with her husband and two surviving dog-children, Rusty and Bella Mae. “Our first dog as a couple was a Golden Retriever named Remington. My husband was not allowed to have a dog while growing up so when our new neighbors moved in with a litter of Golden puppies, Ken had to adopt one of them. Three-month-old Remington joined our family in early 1999 and quickly made Golden lovers of us. He was a huge part of our family until we lost him to liver cancer in July 2008. No warning, he just stopped eating and was gone within a month after the vet diagnosed his disease. We were devastated. We still had our first rescue dog, Busby Beagle, who joined the family in 2004 and was a great brother to Remington. A 15” Lemon Beagle, Busby was found along the road on my way home from work one day. 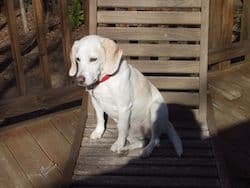 Not having ever seen a Lemon Beagle, I thought he was a small lab until the vet confirmed what he actually was – a beagle with no dark coloring, mostly white. He quickly worked his way into our family, even though beagles are VERY different than Goldens! 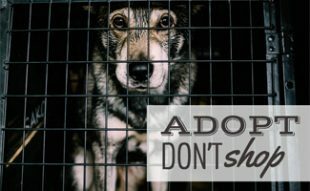 We have learned that stray beagles are typically the result of not being good hunters and are simply not looked for by their hunting owners when they wander off. Busby had a great nose on him and loved sniffing around our wooded yard for any wildlife that may have passed through but probably wasn’t a hunter. He was a snuggler and loved nothing more than to cuddle in his daddy’s lap or with his brother. The vet estimated Busby to be 4-5 years old when I found him and he gave us six wonderful years until we lost him to kidney disease in 2010. After we lost Remington, we definitely wanted another Golden and looked to the NC rescue groups in our area. Because we had Busby who didn’t play much at that point, the rescue group wanted to be sure we adopted a dog that would not drive Busby crazy with puppy antics. We were matched with Rusty, a 2 ½ year old boy in November of 2008. He had lived with an older dog before and had a very gentle, laid back disposition. He was surrendered to Golden Rescue because his family was having wood floors put down and did not want him to ‘ruin’ their floors. (We call the scratches ‘character marks’ in the wood floor in our kitchen!) Rusty and Busby had a great friendship for the two years Busby remained with us after we adopted Rusty. The amazing thing was how much Rusty resembled Remington in color and disposition, only shorter in stature. 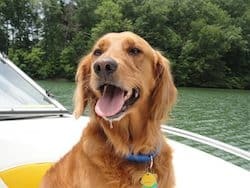 And, like Remington, he loves going boating and chasing tennis balls. Rusty also has a ‘job’ of getting the morning newspaper every day with his ‘pay’ being a treat. 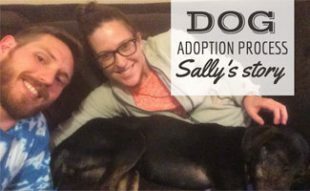 For over a year, we were a single dog family with Rusty and four cats, all adopted, too. 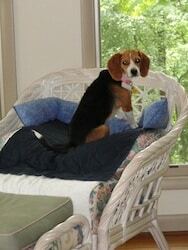 My husband wanted another beagle and forwarded me a ‘Beagle Needs a Home’ e-mail in March of 2012. An adorable little 13” girl had been found almost in the same spot where I found Busby years before. I agreed to go with Ken to check her out that night and we took Rusty along to see if they meshed. Ironically, we had both been thinking about the same name, ‘just in case’ – Bella Mae. She was indeed adorable and loved Rusty so she came home with us after a stop at the pet store to pick out her pink collar, harness and leash. The vet estimated she was about a year old and, surprise, she came into heat the week after we brought her home. So, off she went for spaying. 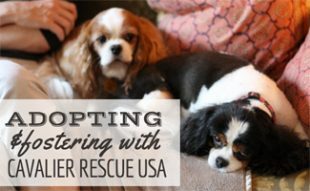 Do you have a dog rescue story? Share your thoughts on the comments below. Bless this family for giving all those furry children your love and care. Those that have crossed the Rainbow Bridge had wonderful years with the two of you. As for Rusty and Miss Bella Mae, well, they have landed in the doggy lap of luxury in this forever home. Not only do they have all this love and devotion from their Mom and Dad they also get to travel and vacation in the Outer Banks each autumn, boating during the summer months and ripping around the yard chasing all those critters they happen upon….or in Bella Mae's case, chasing all those scents she discovers out in the woods. And remember, your Aunti Joni will always have those cookies for you when I visit! !